Maths is very impotent subject in all competitive exam .It is a scoring subject in all exam and now we will show the basic idea of fraction with type and short tricks .It is very helpful for solve the number of fraction type question faster and quickly calculation.The main point in maths subject is if you can get best or good score in math subject so only for depend upon practice and practice and no shot trick of practice and without hard work is not possible improve your maths subjects so give the more time for math subject on practice . 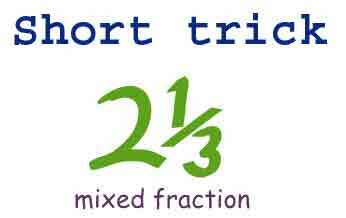 What is Fraction and short trick of fraction ? 2 . Grater then one is improper fraction.